Hair – [e] Enjoy- Essentials NEWWW!! Shape – ::Pixel Inc:: Shape Bianca (Shape, eyebrows & stylecard included) NEWWW!! Shoes – :F: Flore Platforms – Green – (wear with Slink Medium Feet) NEWWW!! Collar – .Pekka. Spiked Collar [Rusty Metal] NEWWW!! Bracelets 6 hoops – Baubles! by Phe CocktailHour NEWWW!! Teeth – DeeTaleZ Teeth & Tongue Piercing NEWWW!! Sunglasses – [ D I R V A L ] Sunglasse_RACE (ALL_IN_ONE) W/HUD NEWWW!! Tattoo – Xtrem-Style TaTToo “Rocker’s” NEWWW!! Pants – BLK2.0 2LOWSLIM_BAGGY-CST (AZTECGREY) NEWWW!! Underpants – BLK2.0 2LOW_Underpant (PACK HEROES) NEWWW!! Sneakers – alterego I inked sneakers – v4 NEWWW!! Dress – *LACUNA* Racey Rib Tank Dress – Pink Pash NEWWW!! Sneackers – ..::Energie::.. MaxSpeed Sneackers Bag NEWWW!! 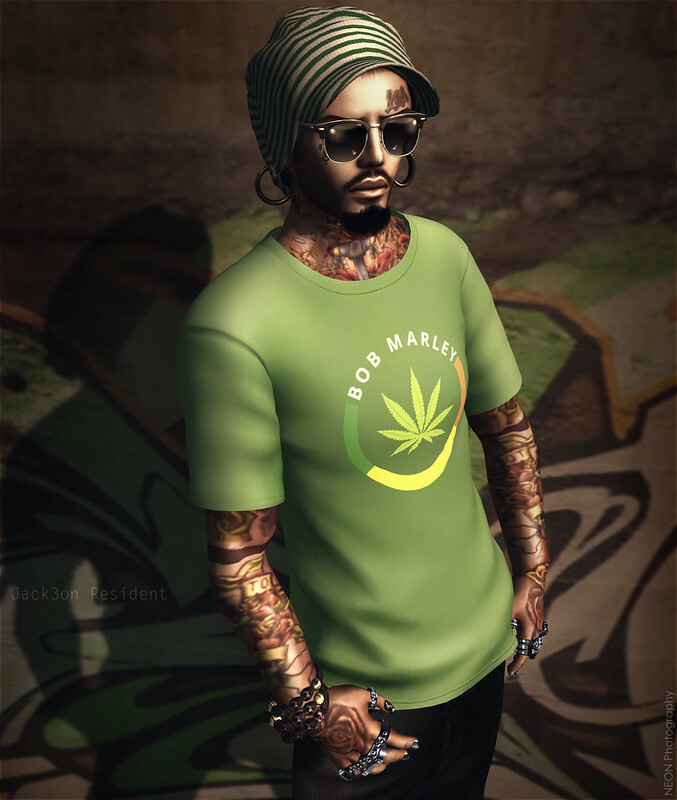 Tattoo – Xtreme-Style “Polynesian Tatto” (Appliers Hud sold separately ) NEWWW!! Shirt- <kal rau> Casual Shirt M3 P-02 W/ shirt and hud NEWWW!! Sneakers- 2Real– DECAZ SHOES NEWWW!! Sunglasses- VooZa – Aviator Glasses NEWWW!! Shirt- Razor /// Rebel Button Up NEWWW!! Tattoo- . :Boss Tattoo:. – Hall of Fame NEWWW!! Beanie- flow . Stretch Visor Beanie – Striped Green NEWWW!! Sunglasses- * S O R G O – ClubMaster Shades D/B (SG) NEWWW!! Tee- .::LOST::. Shirt Bob Marley NEWWW!! Bracelets- * S O R G O – SkullBracelet BLACK/DIAMS, BLACK/GOLD and BLACK/SILVER NEWWW!! Jeans- Razor /// Skillz Baggy Jeans w/ Clip Belt – Black NEWWW!! Sneakers- . ::[NerdMonkey] – [NTW Diablo Sneakers]::. NEWWW! !